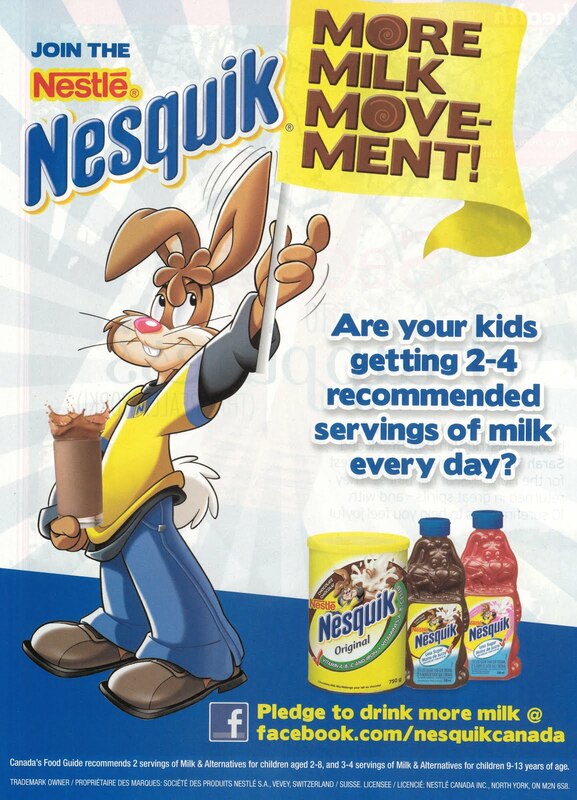 Weighty Matters: Badvertising: What's in Nesquik? Tell me, can you fathom this scenario ever playing out? Kid (with whiny voice): "Mo-om, I don't like milk!" Mom: "Ok honey. How about I make it taste better?" Kid: "What do you mean?" Mom then measures out 3 teaspoons of sugar, dumps them one by one into the milk and stirs. And yet it's happening in kitchens the world over due to the combination of great marketing from the folks at Nesquick (who have currently partnered up with Disney and have licensed their Phineas and Ferb characters to sell chocolate syrup) along with the belief that there's a milk/calcium emergency out there that's so bad that it's wiser to add 3 teaspoons of sugar to every glass of your kids' milk (the amount in a serving of Nesquick syrup) than to have them drink less of it. It's the they don't like fruit so we'd better feed them pie phenomenon. Please don't put sugar in your kids' milk.